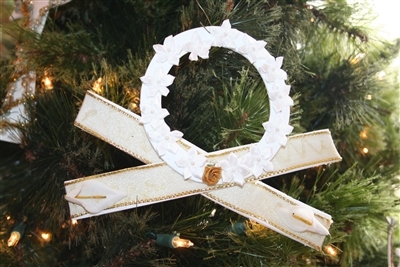 Nan Lee of First UMC, Lakeland, adds Chrismons crafted by children to a tree in the church lobby. Photo by Susan Green. LAKELAND – It’s all very well to deck the halls with boughs of holly, but what better way to celebrate Christmas than to deck the boughs with symbols of Jesus’ birth? The idea of decorating a Christmas tree with ornaments vested in the season’s true meaning is credited to Frances Kipps Spencer of Danville, Va., an artist who started the tradition of adorning trees with glittering Christian symbols at her church, Ascension Lutheran, in the 1950s. The artist died in 1990, but not before trade marking the term “Chrismon,” which stands for Christian monogram and refers to the patterns used to make the ornaments. As her idea spread to numerous denominations, Spencer actively combated the notion of selling the ornaments or otherwise adding to the commercialization of Christmas by cashing in on the popular tradition. 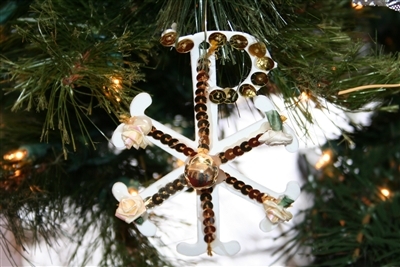 First UMC, Lakeland, has carried on the tradition since the 1990s, when church member Dorothy Geisman began making the gold and white ornaments by hand for the congregation’s Christmas tree. Geisman died recently, but others in the church have taken up the tradition. 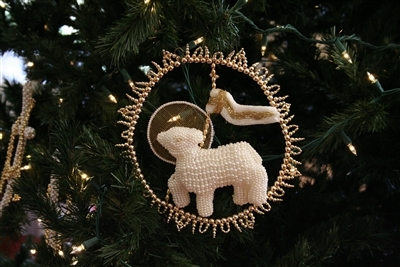 Glittering ornaments depicting Christian symbols adorn this tree at First UMC, Lakeland. Photo by Don Youngs. Youngsters get into the act, too, thanks to Barbara C. Smith, who first started making Chrismons in the 1970s, when she belonged to a church in Stone Mountain, Ga.
Now a member of First UMC, Smith gladly turns her knowledge into a Sunday school curriculum for children preschool age through fourth grade during the Advent season. She and other members of the First UMC United Methodist Women Circle 10 have assembled more than 1,000 Chrismon kits for the children to use. She pointed to a white circle fringed with daisies atop an X adorned by a single rose in the middle and lilies at the ends. It is the “Christ Child in the Manger” Chrismon. The lilies stand for humility of the Christ child, and the X stands for “Chi,” the first letter in the Greek word for Christ. 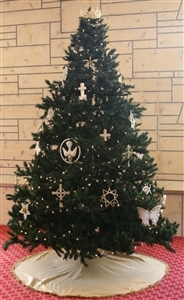 The children have crafted enough ornaments to cover a third tree, also placed in the First UMC lobby to welcome guests during the Christmas season, as well as made ornaments to take home. Preschoolers usually try their hands at the simpler patterns, while the girls often fashion the ones depicting Mary, mother of Jesus, or the Lamb of God symbol. “The boys usually do the fish because, of course, they like that,” Smith said. 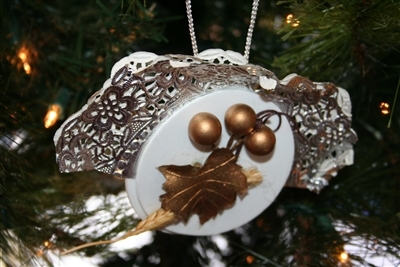 For information about creating your own Chrismon ornaments, click here. Below are some found at First UMC, Lakeland.